The Chiavari chair, also known as the Chiavarina, or Tiffany chair, is a wooden chair of Ligurian design. The Chiavarina was created in 1807 by a cabinetmaker from Chiavari on the northwestern Italian coast, Giuseppe Gaetano Descalzi.They are used around the world where event planners and catering companies appreciate the elegant appearance and lightness of the chair, and its convenient stackability. When browsing online for these chairs, there are a few important things to take in to consideration before settling on a chair. I use the term 'make 'n model', but really I'm just talking about the type of construction your chair is made out of. Lets start with the most fundamental of questions: Wood or Resin? I'm not going to preach that one is better than the other, the choice is yours and it's a matter of personal preference. Wood chiavari chairs give you that natural, old-fashioned (not in a bad way), traditional look, yet still show off an elegant theme. Resin chiavari's will provide strength and longevity, but not without putting out a few extra dollars. 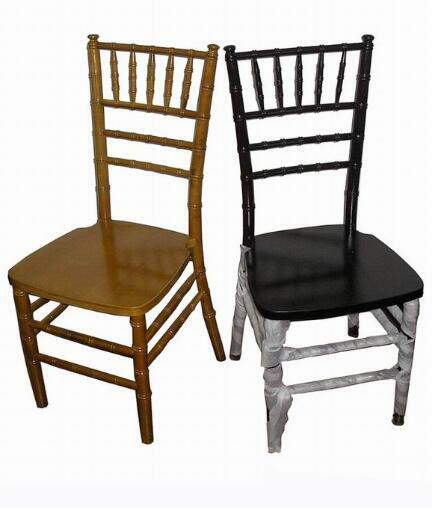 Two types of wood chiavari chairs are made out of are solid "Birchwood" and solid "Beechwood". Birchwood is much denser, and provides a much stronger chair. There are other types of materials such as metal and ghost (also known as crystal or ice chiavari's). But we'll save that for another time. This is something that a lot of all companies do and that's avoid the BIGGEST topic about chiavari chairs: How much will it cost to ship? The answer's not pretty, and for some it might be enough to turn them away. Because chiavari chairs stack together the way they do, and the backs are so high, UPS, FED-EX, and the USPS are unable to ship these in large quantities. Instead, freight carriers are used to haul stacks of these chairs on pallets across the world. The cost of shipping using this method can end up costing hundreds. Unfortunately there really is no other way to get these to it's destination otherwise. Some companies like to promote "free shipping over X amount" with these chairs, but what they end up doing is raising the price of the chair to compensate for the shipping you end up getting for "free". Right below cost of shipping (in terms of importance) is the company that will be selling to you. We strongly recommend researching the company you decide to do business with. If you found a website that sells chiavari chairs through Google, then simply Google the company. 4.) Cushions? Uh, yes please. Try to find chairs that come with the cushions included. These cushions are usually designed to be used with the chiavari chair and add extra comfort to you and/or your guests. Oh, and take it from someone who's currently sitting on a chiavari cushion while he write's this. They're pretty comfy. Although some companies allow you to select what color cushion you want, most usually have a designated color that the manufacturer feels matches perfectly. I know I mentioned that between wood and resin, the choice was entirely up to you. No one will judge you for choosing wood, I just feel like giving my own personal opinion. When it comes to resin chiavari chairs, I will always recommend this type to my customers. It is more durable, resistant to impacts, and it hides any scratches or dents caused by drops and bumps. The reason resin chairs can hide marks is because the color of the chair is the same color all the way through to the core. Wood on the other hand has it's exterior painted the correct color, so any future scratches will remove the paint and show the natural wood color underneath. A bigger price to pay for your chair but a lot less maintenance in the long run. You wouldn't think there was much of a difference between the two chiavari chairs above. Both manufactured to look exactly the same, but they are not identical. The chair on the right costs anywhere from $5 to $10 more per chair depending on where you are looking. Why? The chair on the left is what in this industry is referred to as a "Monoblock Chiavari Chair". The term monoblock is a single structure that has no interchangeable parts. Sounds good, right? Not really. These monoblock chairs were created for one purpose: to offer a more affordable chiavari chair to the public. The downside to these chairs though is that as they begin to flood the market, companies and people purchasing these chairs typically don't know there's a difference between the two. They end up buying what they believe is the same chair, and they're getting a good deal on top of it. A cheaper chair? Yes. A better chair? Not even close. The comparisons in this article refer ONLY to resin chiavari chairs, not wood. Wood chiavari chairs are solid wood all the way through. Lets begin with the bottom of the seat since most chiavari chairs you see online wont show this. The monoblock on the left seems to be missing some material. The seat itself is only a 1/4" thin sheet of plastic, on the right, a standard resin chiavari chair will typically have long strips going down the seat, each one an inch in depth. This provides more support to the seat. Simply using less material is a good reason you might see this chair for much cheaper.